Enterprises understand the importance of securing web applications to protect critical corporate and customer data. What many don’t understand, is how to implement a robust process for integrating security and risk management throughout the web application. Enterprises understand the importance of securing web applications to pro-tect critical corporate and customer data. 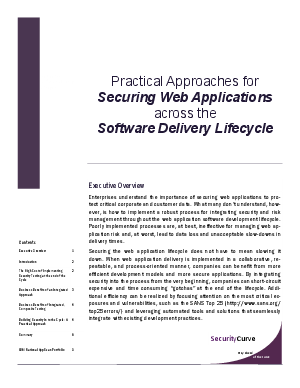 What many don’t understand, how-ever, is how to implement a robust process for integrating security and risk management throughout the web application software development lifecycle. Poorly implemented processes are, at best, ineffective for managing web ap-plication risk and, at worst, lead to data loss and unacceptable slow-downs in delivery times.